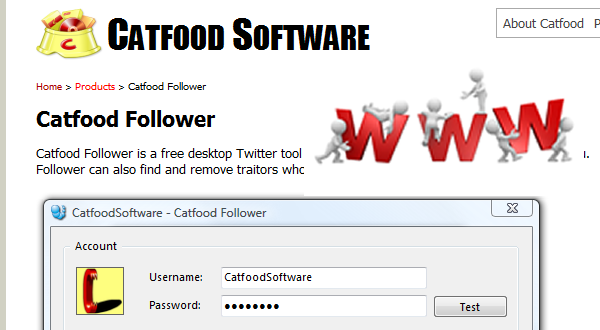 In our series of reviews of social media follower applications, we have tested in the last few weeks Catfood follower. Our testing result in good results, but are we convinced that Catfood is a good alternative to Hummingbird? Should we be satisfied by the Zero cost social media software and dump the $200 software? Our testing of Catfood showed that the application installation and setting was very simple. With couple of clicks you can test your setup results or run live. At every attempt the software successfully auto-follow all those who already followed you and unfollow those who id not follow you within certain time frame. When we tried to run Catfood with a Twitter account larger than 10000 followers it failed every time. When We tried to run the application with two twitter accounts of small to medium size ( less than 3000 followers), Catfood only completed the task of the smaller account. After our review we give Catfood a passing grade , but if you decide to use it , you have to understand that you have to do you new following manually. Hummingbird on the other will allow you to initiate new friendships (new followers) at a large scale by a simple click of a button which gives it an edge over Catfood.